Since the first time I heard of dry tooling, I have had a place in the back of my mind that would be an ideal venue for this much hated sub-sport of climbing. Many see it as sport climbing but with the added evil of chipping holds. However if the growing popularity of things like the Scottish tooling championship is anything to go by then there is interest in this activity. The location that I have had in mind for several years now is amazing, I forgot just how good it is until today when I went back up there to have a look. A 5 to 10 degree overhanging, and absolutely blank slab of rock. Having heard various suggestion for the venue from chipping an extremely hard sports route up it to placing a series of ‘bolt-on’ holds to make an outdoor climbing wall. The problem is the wall is dark and damp, rarely ever dries, and probably the last time it saw direct sunlight was prior to rock metamorphosing into Slate. 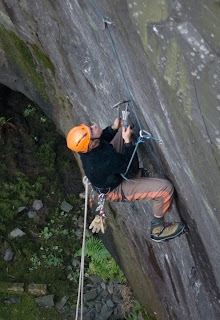 I have dropped many hints to people who mix climb or have dry tooled over the years but, no one took the idea on. My thoughts were if I tried to set a route having had no experience of dry tooling the route would be crap. 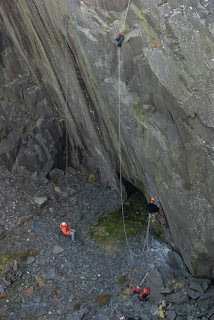 Owain Samuels of Ibex Guides preparing the first dry tooling route in Wales. Fortunately two very driven people have decided to have a go, and experiment on the wall, hoping to establish the dinorwic quarries first ever M grade route. Now before people get on there high horses about ethics, I am going to give you all my opinion. 1. This wall is and has been redundant since it was quarried, as such no routes are really being effected. 2. The locals developing this see it as a limited experiment to this one wall at present to see whether Slate makes a suitable medium. 3. Chipping has happen historically in the quarries since the very beginning. Of particular relevance is the wall with Satisfying Frank Bruno on, where Paul Pritchard basically drilled finger pockets! For any mixed climber who question the validity of dry tooling. Every time I climb a route that winter climbers scratch there way up I can’t help think that if I did that to a route at stanage I would be shot. Whilst many mixed climbers argue that its everyone else who climbs when the route isn’t in condition that damages the rock, I can’t help feeling that they are only trying to fool themselves. As if the route is covered in snow, I often see climbers do there best to scrap it all off to revel the rock. May be dry tooling is the future, maybe we should realise that winter climbing damages the rock that as a climber I love, and set aside routes for the tooled up to trash! Anyway, before long there will be at least one route, hopefully two or three more in the slate quarries.